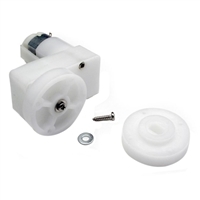 Another available-from-Solarbotics-only motor is the GM9 143:1 gear motor. The GM9 is much like the GM3 gear motor but runs at nearly twice the speed. This motor goes 40RPM at 3V, drawing 400mA at stall generating 44.4 in oz torque (free running at 50mA).